IF YOU LIVE IN AUSTRALIA & ARE OVER 18 YEARS OLD, YOU CAN CHOOSE FROM ZIP PAY OR AFTERPAY AT THE CHECKOUT. Pay for your purchase in 4 easy payments, due every 2 weeks. Pay nothing upfront! AMAZING! You only pay for the item, there are no additional fees. You will only be charged small fees if you fail to make your payment on time. No new card applications, or complicated forms. Afterpay is super easy to sign up to, you can even sign up at the checkout. If you have further queries please feel free to Contact Us or take a look at our FAQ Page. Read more about Afterpay here. Zip Pay is a newer and more flexible option. Every time you make a purchase it gets added to your account. Then at the beginning of the month, Zip Pay will send you a summary / statement of what you spent & what you paid in the month. You can then pay it back in full at the end of the month or pay over time from as little as $40 a month, interest free. 1. Select Zip Pay as your payment option at the checkout. 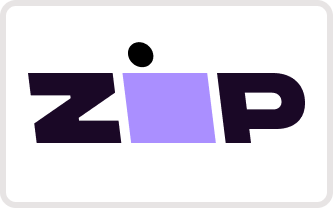 Read more about Zip Pay here.